If you’ve been picking up what OSHA has been laying down lately, then you’re probably already aware that the watchdog agency has implemented new guidelines regarding acceptable exposure limits to silica dust. While these new requirements can affect the designs of a good many tools used in masonry applications, dust extraction seems like a particularly affected area of the trade. That being the case, we recently looked at some of the leading manufacturer’s OSHA-compliant Dust Extractors in this past month’s shootout. Makita, who has been ahead of the curve with OSHA compliance, gave us the chance to take a look at one of their traditional portable models. The Makita VC4710 includes the features necessary to meet the new OSHA guidelines, as well as the power to meet the needs of professional applications. With space for two HEPA filters and 12 amps of total power, the Makita VC4710 Xtract Vac will keep your worksite clean while keeping you out of dutch with OSHA. One of the main requirements for OSHA compliance revolves around the HEPA filter. The filter needs to capture 99.97% of particles that are 0.3 microns and larger to be considered a HEPA filter. The Makita VC4710 has space for two optional HEPA filters, although the unit doesn’t ship with any; you have to purchase them separately. While OSHA also requires automatic filter cleaning on dust extractors, some models will have better systems than others. The Makita uses a reverse air flow method to clear out the filter every 15 seconds to extend the filter’s usefulness. However, the reverse air flow method can shorten the filter life or possibly allow a small amount of dust to escape. We didn’t see the latter in any of our testings and it’s too soon to know how much actual filter life we’ll get. The Makita VC4710 also features pass-through power. It’s somewhat limited by allowing a max of 600 watts. But that’s not unusual and it’s a little higher than some of the extractors we’ve used. The Makita VC4710 also has plenty of accessory storage toward the back of the unit. Makita has one of the better systems for the power cord, but the hose storage left us wanting. Though to be fair, though, no one really tackled this area super effectively. When looking at dust extractors, companies will generally test their equipment while measuring CFM and water lift capabilities. The CFM tests look at the volume of air that the motor pulls through the hose. Water lift looks at the lifting power in a closed air system. Both measurements have importance in this field. For the water lift test, we ran each dust extractor with a clean HEPA filter the first time through. The Makita VC4710 lifted water up 77.5″ through a 2-1/2″ pipe, finishing 2nd behind Hilti’s model. The really interesting thing about the Makita model happened when we ran the same test after sucking up 20 lbs of concrete dust. 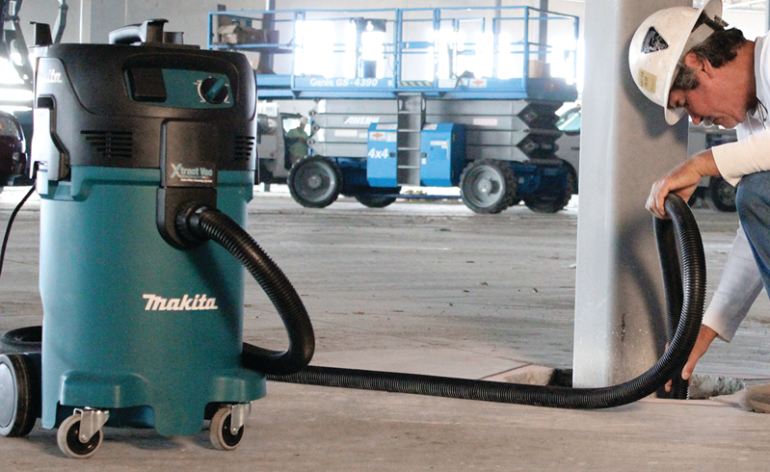 Where every other dust extractor lost some performance, the Makita performed exactly the same. Plus, where other models lost some significant performance during their cleaning cycles, Makita’s performance only dropped 5 percent. We used the same idea for our CFM tests, where we used a clean HEPA filter for the first run and then again after sucking concrete. When you look at the area that’s completely cleared, Makita is in the middle of the pack but drops to the bottom when you consider the outside edge of the cone where there was a smaller effect. That’s all great, but we’re talking about differences of 1/8″ or 1/16″ which isn’t much. The important thing is that the extractor is rated at 135 CFM – and that’s what you’ll use to determine what tools you can use with it per OSHA regulations. When we look at the amount of clearing area Makita does, it’s still doing enough work to absolutely be Pro-level. With its 135 CFM rating, it’s doing a little less work than the 150 CFM models – and that shouldn’t be a surprise. However, 135 CFM means that you can only use a 5″ grinder instead of the 6″ OSHA-compliance that kicks in at the 150 CFM mark. The Makita VC4710 has a lot going for it that makes it a worthy consideration for purchase. Should you find yourself in the market for an OSHA-approved dust extraction system, you might appreciate that this dust extractor represents the best value of any that we tested. Of course, it’s a fine choice for those Pros that are not in the concrete industry as well. Makita has priced the VC4710 at $529, which makes it about $70 cheaper than the next model up and $379 less than our most expensive! Unless you need more than 135 CFM, the price point makes this model a very attractive option. —This article is by Chris Boll and first appeared on ProToolReviews.com, a site dedicated to delivering up to dat info on tools of all types.